On PRWeb 27/09/2013: The Italy and Malta Oil & Gas 2013 Summit is taking place on 30-31st October at the Hotel Parco dei Principi in Rome to explore the investment opportunities in the Italian and Maltese oil and gas industry and indicate the key factors that will make any investment in the sector of the region commercially successful. The interest for Mediterranean offshore over the last three years brings again to the spotlight Italian oil and gas reserves, which after a ban reversal, have seen a growing interest with existing companies expanding their local presence or restarting projects that fell under 2010 restrictions. Italy’s Val D’Agri oil basin has been characterised as one of the largest in Europe, and its potential is still being discovered with many experts considering the Italian natural reserves completely underappreciated. 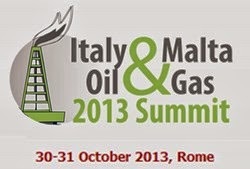 The Italy and Malta Oil & Gas 2013 Summit is taking place on 30-31st October at the Hotel Parco dei Principi in Rome to explore the investment opportunities in the Italian and Maltese oil and gas industry and indicate the key factors that will make any investment in the sector of the region commercially successful. The summit will be a senior level networking platform that will analyse the oil and gas industry of Malta and Italy from every aspect including topics like; investment opportunities in the Italian oil and gas industry; implications of the Italian legal...read on.